Beautifully drawn, clear and easy to follow, delicious and simple recipes, and simply fun to look at! 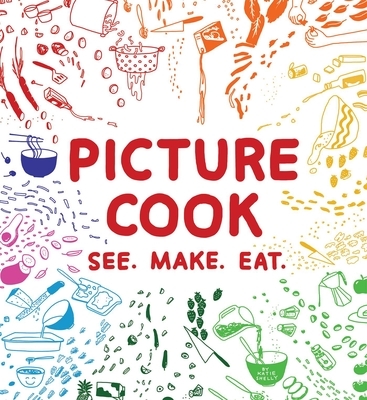 With illustrations instead of text, Picture Cook will reinvent the way you make food. Over 50 homey recipes are distilled into their most basic components, each rendered step-by-step in enchanting line drawings like nothing ever before seen in a cookbook. Covering everything from omelets and lasagna to chocolate cake, this cheery bunch of recipes will cure your kitchenphobia, delight the design lover in you and satisfy every tummy in your path. Including a visual tutorial on knife skills, illustrated metric conversion chart, and an index especially organized for various dietary needs, Picture Cook makes the perfect gift for budding chefs, college students, or any home cook in need of some visual inspiration. Katie Shelly is the Picture Cook. A graduate of Wesleyan University, she works in media production at the Cooper-Hewitt Design Museum and lives in Manhattan. She lives her life the way she cooks -- experimenting, improvising, loosely following the instructions, and with style.